Research is the center of education, as research enables one to be a “knowledge producer”, instead of being merely “knowledge retailer”. The quality of research is measured by both quantity and quality (impact) of publication, which is highly preferable to be delivered in the form of international journal papers, with high quality. 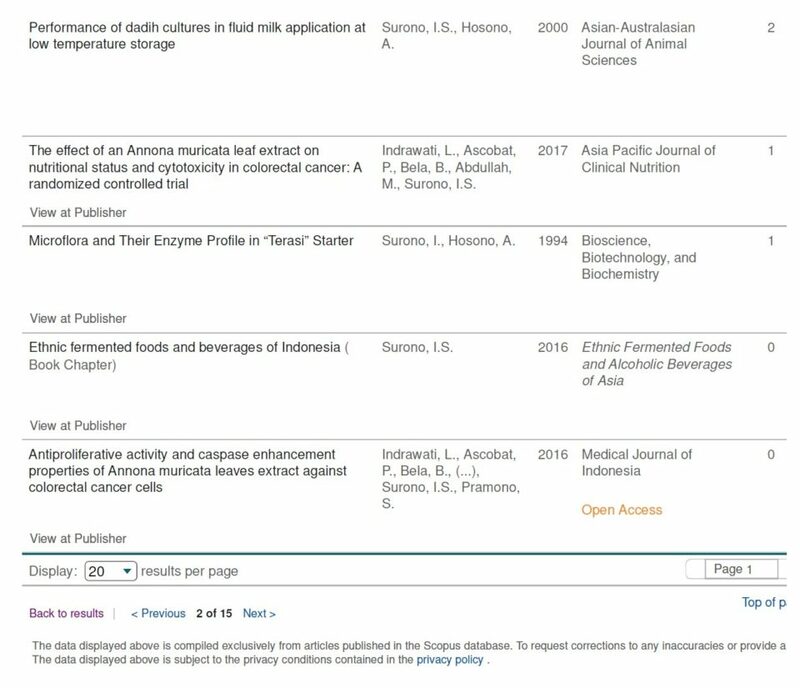 In Binus University, the performance of publication of each faculty members is monitored through Scopus.com, the world’s biggest database indexing data of peer-reviewed publications. 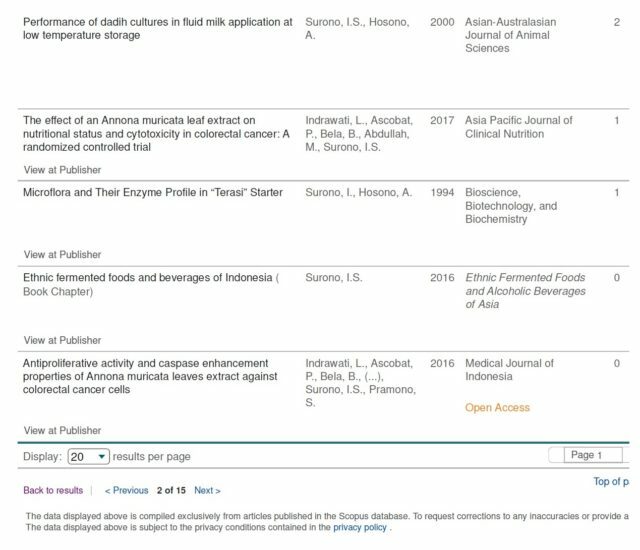 At Scopus, an affiliation (either universities, research groups, or companies) may see the publication title, journal title, list of authors, the profile of a particular author, also when the publication has been indexed at Scopus, and how many citations obtained by a paper. There is still a debate on how successful publication performance of a particular researcher/faculty member is measured, as there is a trade-off of quantity and quality of publication (where high quantity of publication often sacrifices the quality, and vice versa). At 2005, Jorge E. Hirsch suggested a type measurement that may assess both quantity and quality (impact) of publications simultaneously, which is by using h-index. 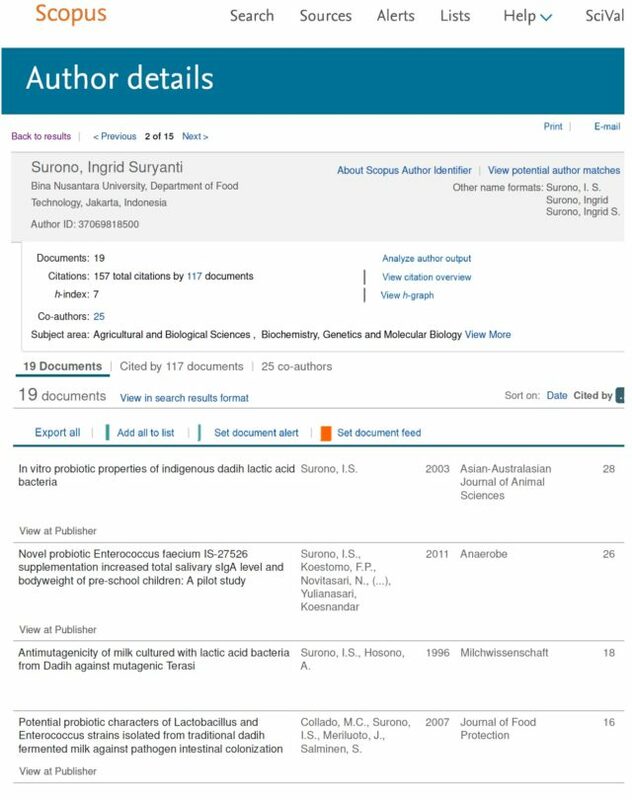 Her Scopus profile tells us that she has at least 19 papers indexed at Scopus, with various numbers of citations (sorted from largest to smallest), with h-index of 7. 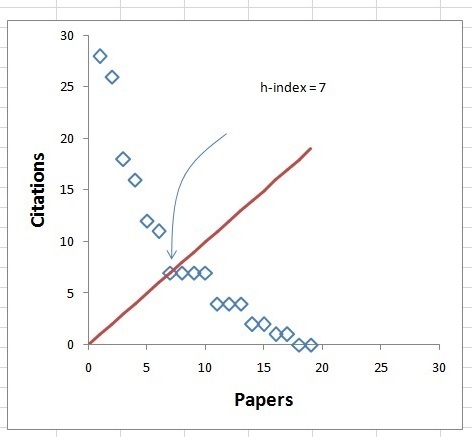 Her publication profile is simplified into: If we plot number of papers vs. citations, along with another function, y=x, we will get an intersection, at x=y= 7, which is the h-index. The importance of h-index, at least for Indonesian scientist, is for enabling emerging scientist to submit proposals twice as many as their peer. In Indonesia, submission of research grants to the Indonesia Ministry of Higher Education is limited to 1 proposal as principle investigator and 1 proposal as a member. However, for those who have h-index more than 2, they are allowed to submit 2 proposals as a principle investigator and 2 proposals as a member, or in other words, maximum of 4 proposals! Besides the impact of a publication as measured by the citation number, and thus related to the h-index, there is also a famous parameter named “impact factor” to measure the prestige of a particular journal. 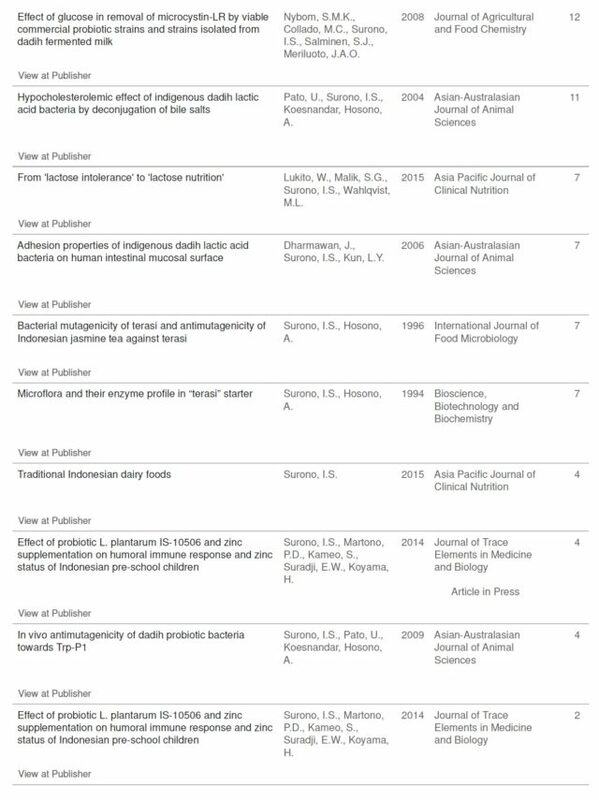 It is defined as the number of citations from all the articles published in journal X, divided with the number of articles released by journal X, within 2 years. So, with citation of 100 and 200, from 50 and 100 papers published by journal X, respectively, then the impact factor for journal X is 300/150= 2.0. 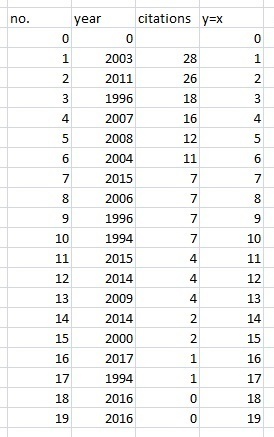 To maintain (or increase) the quality, an editor for journal X must be very selective, as a paper might be of subpar quality, thus not getting read and obtains no citation at all. However, the editor could not deliberately reject papers in order to maintain quality, as the number of published papers also must be at a sufficient quantity, otherwise the publication cost could be high and not economically feasible. 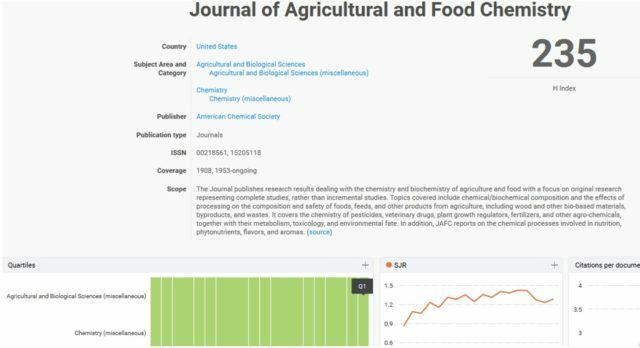 Journal of Agricultural and Food Chemistry (Bu Ingrid has a publication in it, at 2008, with 12 citations), with unbeatable Q1 reputation from 1997-2016 at two different fields of Agricultural and Biological Sciences, and Chemistry. AMANKAH PRODUK SUSU UHT UNTUK ANAK-ANAK?